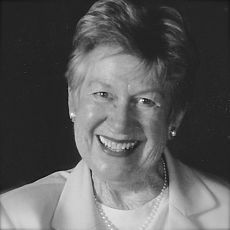 Martha Tavis Boise died from natural causes on November 18, 2015 at age 86 at the family home on Hollister Ranch surrounded by her five children. Marty was born April 7, 1929 in Bismarck, North Dakota. She was a fourth generation North Dakotan. She was married for 58 years to the love of her life, Spencer Boise, with whom she had five children: Barbara Walsh, Beverly Boise-Cossart, Brenda Boise, Steven Boise and Philip Boise. All her life Marty was known for her gracious smile and friendly personality. Marty received her B.A from the University of North Dakota in business education. After graduation she worked for an advertising agency in Chicago. There she met Spencer Boise who was a recent MBA graduate from the University of Chicago and a family friend from Bismarck. They became engaged and were married in Bismarck, October 11, 1952. Two years later the family moved to Cincinnati, Ohio. In 1968 the family moved to Southern California, where all the children completed their high school and college educations. In 1973 Marty and Spence bought property for a second home on the Hollister Ranch. Over the years, this location grew to become the central gathering place for four generations of the family. After Spencer’s retirement from corporate life in 1988, he and Marty moved to Montecito, where they lived ever since. Marty became a widow in September 2010. She is survived by her five children and their families, including eighteen grandchildren and seven great-grandchildren, as well as her younger brother, Lee Tavis of South Bend, Indiana. An older sister Nancy Tavis Larson died in 1995. A mass was held for Marty on Saturday, November 21st at Our Lady of Mount Carmel Church. Burial will be at the Santa Barbara Cemetery. In lieu of flowers, donations may be made in Marty’s memory to Our Lady of Mount Carmel Church, 1300 E. Valley Road, Montecito, California 93108.